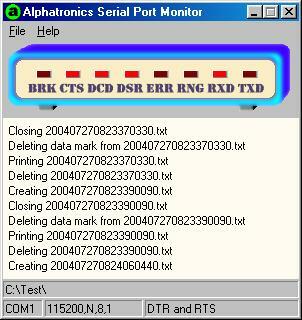 With Serial Port Monitor, you can capture binary data from the computers serial port, and with the use of a serial to parallel converter, you can capture the data from the printer port of another device. It is useful in capturing data from devices that do not have the ability to "print to file". Serial Port Monitor fills a need where the device being captured is either proprietary, or does not have the ability to print to file. It can even capture data from your own computer for software that insists on printing to LPT1:, with the use of a parallel to serial converter. First, you will need to determine if the device qualifies to be connected to. Do not guess or experiment with the ports of an undocumented device. The 9 and 25 pin connectors are commonly used for all types of interfaces and aren't always serial or parallel ports. In general, if the device was already connnected to a printer, then you can connect it to Serial Port Monitor. A tool, called a "breakout box" can be used to determine if a port is a serial port. Do not use Serial Port Monitor as a breakout box. When the signals are in their inactive state, the line voltage is NEGATIVE (-) 12 volts, which could cause serious damage to incompatible ports. In addition to Serial Port Monitor, you will require hardware to connect the sending device to the receiving PC. The cables, adapters, and optional parallel to serial converter are avalable at your local computer store or at various internet stores. If the sending device has a parallel port, you will need a parallel to serial converter. The serial connection on this converter becomes the "device" in the following table. If the device is transmitting its data directly out its serial port, use the table to assist in determining the type of connecting hardware. The table assumes that devices wired as Data Terminal Equipment, or DTE, have a male connector and Data Communications Equipment, or DCE, have a female connector. Be careful of certain Parallel to serial converters. Often they can be switched to be DTE or DCE, but of course the connector will remain the same, which will require a gender changer for the device if the combination of switch setting and connector gender deviates from the standard of DTE=male and DCE=female. Also, be sure to select one that is primarily a parallel to serial converter instead of a serial to parallel converter. This will save you a lot of trouble with cabling. In particular, make sure the parallel end has a female connector, with wire "ears", that accepts a standard parallel cable. Some devices, including the PC, require the support of the DCD line. Most crossover/null modem cables have special wiring built in to support it, but a straight through cable does not. This is because a crossover cable is used to connect 2 DTE devices and the DCD pin on a DTE is input only. For this reason, if given the choice of using or not using a crossover / null mode cable, choose to use one. Adapters that change the connector type and/or gender do not change the DCE/DTE status of a connection unless the adapter specifies it does, with a term such as "null modem". * Caution: May be a parallel printer port. Never connect a parallel port directly to a serial port. Consult the documentation for the device to verify if its a serial port and if not, use a parallel to serial converter. Serial Port Monitor is delivered as the full product. An activation code is required to eliminate the registration reminder that shows when first executed, 60Kb file size limitation, and 5 per session file count limitation, enabling you to evaluate the product before purchase.